Australian icon Sir Don Bradman’s story of signing autographs is almost as legendary as his cricket feats. ‘The Don,’ widely acknowledged as the greatest batsman of all time and statistically the greatest sportsman in any major sport, finished with a test batting average of 99.94. A ‘duck’ in his final match, just four runs short of a batting average of 100. During the Great Depression ‘Bradmania’ was responsible for reviving the spirits of a nation. Between scoring centuries and media commitments, he spent hours answering fan mail, often hundreds a day. It was only when he reached 90 years of age did he stop signing en masse. Among many stories was one when Sir Don was walking to a local shop, a man stopped him and asked if he was ‘Don Bradman’. He confirmed, but neither had a pen or paper for an autograph, so he asked him if he wouldn’t mind waiting so he could go and buy the necessary items to collect his signature. The man returned to find the cricketer still there and he duly signed. That wouldn’t happen with any celebrity these days! Australian star batsman Doug Walters was part of an invitational team to play a charity match at Queen’s Park, Invercargill, New Zealand, in early 1988. I drew a caricature of him and he signed it at the ground. Later, I copied a few off and numbered them and he signed them at the Kelvin Hotel that evening. I had an idea of drawing a number of Australian Cricketing legends, including Dennis Lillee, Rod Marsh, Greg Chappell and Allan Border. Doug said most of them were playing in Tasmania the following week, so he would get them signed and returned. They were all currently playing, but the one and only Don Bradman. He had long since retired, but was still included as an administrator and selector. Doug said that Sir Don often visited the Sydney Cricket Ground where Doug had a stand named after him (demolished in 2007). In short, he was able to get Sir Don to sign ten copies of my caricature. All were signed, dated and numbered. He also signed a run chart of his highest test innings of 334 at Headingly against England in 1930. The items were donated to charity for auction. With all the fuss I completely forgot to get one for my own collection, so I sent another copy to Sir Don. He not only signed but also personalised it – one of my most treasured items. Sir Don passed away on 25th February 2001 aged 92 years. 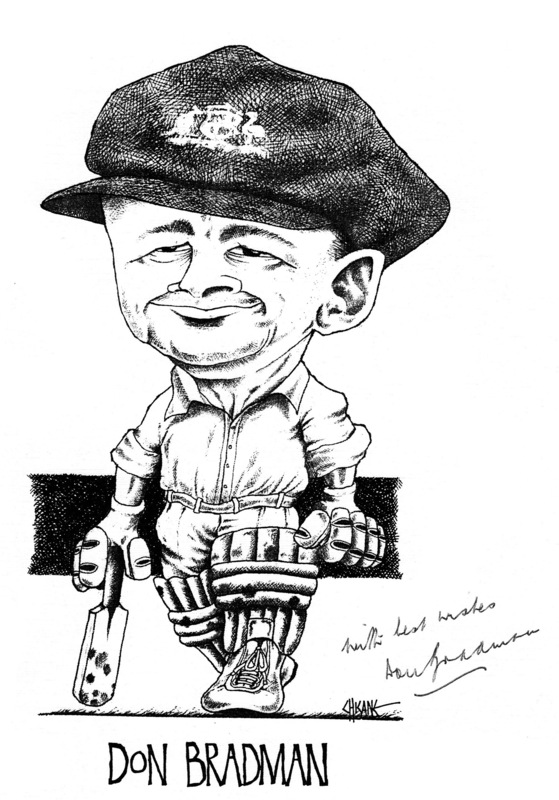 This entry was posted in Caricature, Celebrity, Sport and tagged Australian, Autograph, Caricature, Cricket, Don Bradman, Drawing, Signature, sketch by Mark Winter / Chicane. Bookmark the permalink.